Can you think of anything better than a big juicy steak for dinner? Nope! Not me! This is definitely a favorite for my whole family. I am going to fill you in on how I use my cast iron pan and some herbed ghee to make the most tender and juicy steak! You only need a few simple things to obtain a tender and juicy steak in the kitchen. First things first, you will need a cast iron pan. I am a true believer in cast iron and I won’t even throw a steak on the grill anymore. I get the best results with my Lodge Cast Iron. You will also need an herbed ghee or you can make your own herbed ghee with a few ingredients: garlic powder, rosemary, and thyme. The herbed ghee is going to make your steak burst with flavor. It is so simple to do and the results are spectacular. It requires only minimal effort. The first thing I do when I am prepping to cook a steak is to take them out of the fridge and let them rest for a bit. This is when I salt and pepper them on both sides. You also need to start heating your cast iron pan. You want to ensure that your pan is hot when you throw the steaks on so they can get a nice sear to them. 4th & Heart makes a wonderful garlic ghee that you can add your seasonings (rosemary and thyme) to. If you cannot find this brand with the garlic already in it, any kind of ghee will do. I do highly recommend 4th & Heart though. I know my Kroger store carries the regular one. These ghees are also available on Amazon and you can get them conveniently delivered in two days if you have Prime. If you do not yet have Prime you can try a free 30-day trial through this link. 4th & Heart ghee is top-notch when it comes to all of the ghees available. Ghee has wonderful health benefits and is a much better alternative to butter. With ghee, all of the milk fats are removed. It is considered a clarified butter and is lactose-free and dairy-free. Ghee is known to improve the digestive tract and repair it. Ghee is very aromatic and when you are cooking with it in the kitchen your house is going to smell amazing. For the ghee, what I do is I melt down a few tablespoons. Your ghee keeps in the fridge and is solid like butter. You can melt your ghee down in a small pan and add some garlic powder, rosemary, and thyme to it. You don’t need to go crazy with the seasonings here, just give the ghee enough to have some flavor infused throughout it. While the steaks are cooking in the cast iron pan you can spoon the herbed ghee onto the steaks. I just keep spooning in on over the top of the steak and it marinates it with absolutely awesome flavor. I like my steaks medium rare so I only cook my steaks for a few minutes on each side of them. I served these ribeye steaks up with some roasted red skin potatoes that also had garlic powder, rosemary, and thyme on them. It was a perfect pairing for the steak. 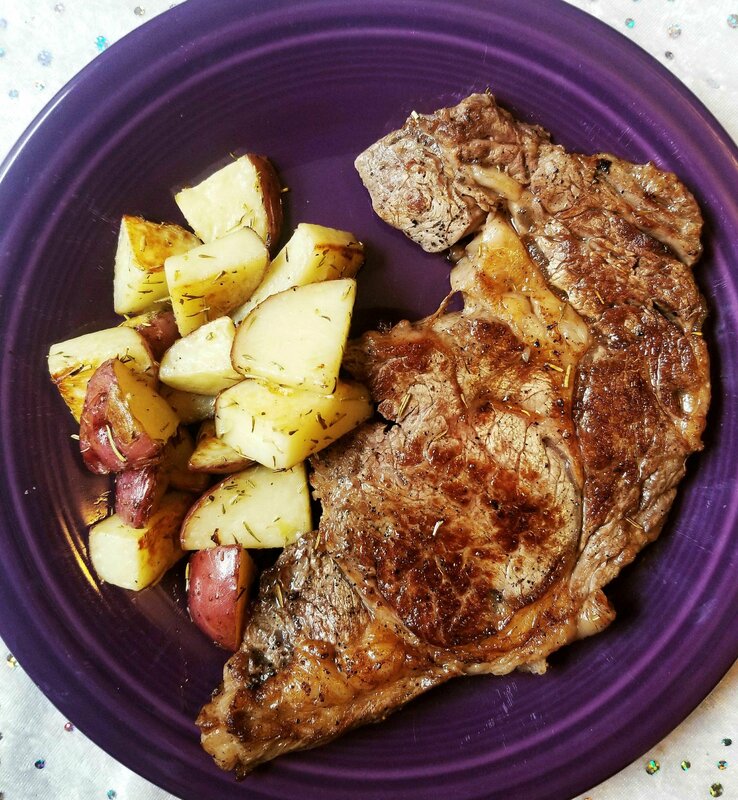 We truly enjoyed this steak and potatoes meal on Labor Day. There were lots of ooo’s and ahhh’s coming out of our mouth while taking our time and devouring it slowly. I hope you give this a whirl. If you do please let me know how you liked it. It is one of my favorite ways to cook a steak nowadays. How do you like to cook your ribeye steak? Leave me a comment and let me know how you serve them up! This entry was posted in My Cooking Journey, Recipes and tagged 4th and Heart, amazon, cast iron, cooking, garlic, ghee, gluten free, glutenfree, herbed ghee, Lodge, meat, paleo, potatoes, primal kitchen, red skin potatoes, ribeye, rosemary, shopping, simple, steak, thyme. Bookmark the permalink. We are of like minds! I only cook steaks in my cast iron as well. Better than grilled for sure!! Hell yeah! Cast iron is the best way to go if you want a juicy steak.